LayerZero Power Systems was founded by two entrepreneurial engineers who believed that you, the mission critical power system customer, simply deserved better: better products, better process, and better service. This simple belief has grown into an unapologetic passion for excellence and has attracted the best people, who in turn have developed the best products and processes to serve your needs. Forward-thinking and visionary, LayerZero Power Systems has a proven history of innovation, excellence, and honest business ethics. LayerZero has focused intensely on building quality into the processes of designing our products, and have made continual efforts on making the products we design better. From humble beginnings, LayerZero now designs a complete suite of power quality products that cover all aspects of critical power distribution. LayerZero Power Systems has forever changed the expectations of power reliability for the world's leading companies. Our honest business philiosophy, intense focus on product quality, and company-wide initative to continually improve is what makes LayerZero different. We are proud to proclaim that LayerZero Power Systems designs the most technologically advanced power quality products on the planet. 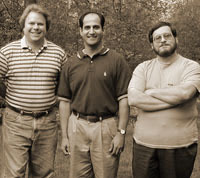 The LayerZero Team in 2001. All great companies have their story. The LayerZero story started with brilliant ideas, hard work, sheer determination, and self-belief. In April 2001, at the beginning of the "dot boom" era, LayerZero Power Systems was founded by engineering graduates Milind Bhanoo and Jim Galm. Risking their life savings, the co-founders left secure positions with the idea of designing power quality products that were better - more reliable, safe to operate, well-connected, with highly advanced power-quality monitoring capabilities. Working out of the attic of a garage, the company diligently worked on designing an building the first LayerZero demo unit. The founders hired a mechanical engineer, an electrical engineer, and a software engineer to design the OPTS, the Optical Power Transfer Switch, a Triple Modular Redundant Static Transfer Switch that was years ahead of it's time. Seeing success and potential, LayerZero's VP of sales Anthony Pinkey relocated from New York City to Cleveland, Ohio to work on building the LayerZero name within the mission-critical industry. The LayerZero story started with brilliant ideas, hard work, determination, and self-belief. The LayerZero team understood that the overall product architecture, user interface, and mechanical design was drastically different than any power distribution solution ever conceived. Innovations and industry-firsts included in the OPTS included a fault-tolerant design, redundant technologies, and usage of fiber optic controls. The decision to add convenience features such as the touch-screen interface, waveform capture, and TCP/IP access was forward-thinking and visionary. Safety features, such as front-only access for installation and maintenance set the standard for data center equipment. The OPTS utilized a footprint that was very small. 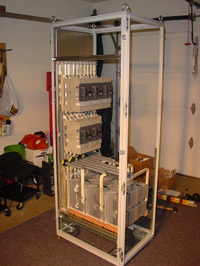 The First OPTS Built by LayerZero Power Systems. Within the first year of incorporation, the company had designed, built, and tested the OPTS Static Transfer Switch. During this period, LayerZero obtained ETL listing to referenced UL and CSA standards. Equipped with an innovative design, LayerZero worked on building their vision of creating the best products in the industry. The company developed a manufacturing and field service alliance with Russelectric, the leading supplier of power control systems and equipment, to manufacture and service LayerZero equipment on a large scale. The company's big break came when LayerZero Power Systems convinced a large US based bank to invest in a set of the new OPTS Static Transfer Switches to boost the reliability of their data center processing center, systems that are still working strong today. Simultaneously, the company launched a three-source OPTS, as well as a Single Modular Redundant OPTS. Equipped with an innovative design, LayerZero worked on building their vision of creating the best products in the industry. An ePODs Installation from 2003. 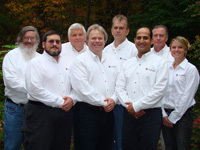 In 2003, LayerZero continued to build the product line and develop solid processes for maintaining the company's products. 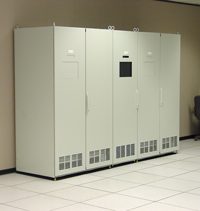 In a move that would forever change the data center industry, the company developed the ePODs product line, web-enabled Power Distribution Units that were inspired by NFPA-70E. ePODs are designed with an emphasis on maximizing worker safety. ePODs utilized a slightly larger footprint than comparable products, however, could be safely maintained without shutting down the critical load. ePODs had built-in MODBUS/TCP capabilities for ease-of-connectivity to power quality monitoring systems. During this period, the company obtained listing to ETL listing to referenced UL and CSA standards for ePODs. ePODs are designed with an emphasis on maximizing worker safety. 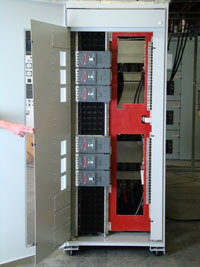 The ePODs: Type-N was released to manufacture, a Static Transfer Switch with a distribution panel built-in. In addition, the company released the ePODs: Type-S, a Power Distribution Unit (PDU) with a secondary-side Static Transfer Switch, two transformers, with distribution. LayerZero also released the ePODs: Type-P, a PDU with a primary-side Static Transfer Switch, transformer, with distribution. Both products launched with an operator training program to help guide end-users on proper equipment usage. During the same year, the Field Service Training Module was launched, a web-based resource for documenting customer service projects. In addition, the company successfully demonstrated a Dynamic Phase Compensated Transfer, technology that introduced an appropriate delay so that switching is completed at the optimal moment. This technology is patented under US Patent 7589438. 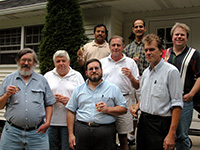 The LayerZero Team in 2004. Continuing to further develop the breadth of the company's product suite, LayerZero Power Systems designed and released the larger 800 A OPTS. 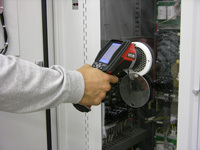 The 800 A OPTS was tested at KEMA-Powertest labs, and obtained ETL listing to referenced UL and CSA standards. 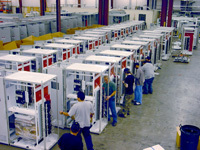 ePODs: Type-P Units in Manufacturing in late 2004. Shortly after, the OPTS listing was extended to 600V. Aiming for improved process transparency and a more-open relationship with it's customers, LayerZero launched the CustomerWeb portal, a web based resource for tracking projects with LayerZero products. CustomerWeb was a database-driven website that provided customers instant access to company information and processes. A web-based tracking resource was the blueprint for a comprehensive reliability program. The CustomerWeb portal included real-time product testing documentation, and an incident report tracking tool. Understanding the importance of critical board tracking, the company implemented a solution for serialized tracking of all critical components. LayerZero hosted Customer Service Engineer training sessions throughout the year to further develop the service team. A web-based tracking resource was the blueprint for a comprehensive reliability program. 2005 was an exciting year for LayerZero, advancements included the extension of the company's product offerings, improvements in convenience and connectivity, as well as significant progress in furthering the company's process transparency initiatives. ePODs listing ETL to referenced UL and CSA standards was extended to 300kVA, further proving the company's design capabilities. In addition, the 1200 A OPTS completed a High Fault Test at KEMA-PowerTest labs. The 1200 A OPTS was listed to ETL listing to referenced UL and CSA standards. The product was ready for market, and shortly after, the 1200 A OPTS was launched. NTP helps improve post-event reconstruction when integrated lines of Static Transfer Switches, Power Distribution Units, and Power Panels are utilized. This release of the 1200 A OPTS coincided with the announcement of OPTS Clock Synchronization using Network Time Protocol (NTP). NTP Synchronization was the foundation for the company's "Black Box Forensics" technology, permitting customers with the ability to view event history of past electrical events. NTP helps improve post-event reconstruction when integrated lines of Static Transfer Switches, Power Distribution Units, and Power Panels are utilized. Finally, LayerZero announced the released the ePODs: Dual Type-P Power Distribution Unit, a PDU with a primary-side Static Transfer Switch, two transformers, and dual distribution panels. 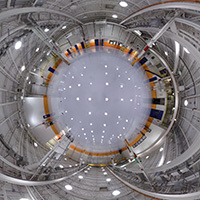 Setting the path for the future vision of the mission-critical industry, LayerZero released a collection of features that helped maximize operator safety in the data center, as well as reliability improvements. Early in 2006, LayerZero launched Source Adaptive Gateing (SAG) compensation technology. In addition, the company released the 1200 A, 3-Source OPTS Static Transfer Switch to manufacture. First to launch in recognition of NFPA-70E recommendations was the Series 70: eSTS Static Transfer Switch, an STS that showcased a completely redesigned interior that permitted front-only installation and maintenance. Utilizing a front-only design helps data centers utilize available space more effectively, and helps make preventive maintenance easier. The Series 70: eSTS utilized InSight™ IR Portholes, openings containing a mesh that allowed bolted connections to be safely thermal scanned. Utilizing a front-only design helps data centers utilize available space more effectively, and helps make preventive maintenance easier. 2007 was the year in which LayerZero won landmark orders with two leading credit card companies: (56) 300kVA Type-P ePODs and (94) RPPs for one; and (25) 800A eSTS for another. Focusing on improving power reliability, LayerZero Power Systems developed, tested, and launched a suite of Selective Trip Coordinated Solutions. 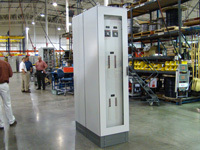 The Series 70: eRPP was launched, a web-enabled Remote Power Panel that featured the LayerZero designed Finger-Safe (IP-20) 400 A SafePanel™ Panel Board. 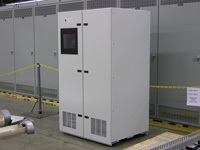 Inspired by NFPA-70E, the SafePanel helped maximize data center operator safety. The first finger-safe RPP ever designed, the eRPP utilized high-speed, current limiting, fast-acting circuit breakers to ensure selective trip coordination throughout the RPP. If a downstream breaker tripped, the eRPP was designed so that only the branch breaker is affected. 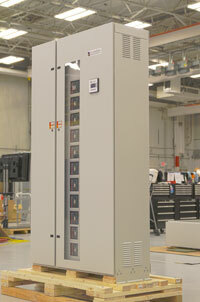 Building on the success of the 400 A SafePanel, LayerZero designed, built, and launched the 1200 A SafePanel. The 1200 A SafePanel is a finger-safe (IP-20) panel board that is made for higher-power applications, such as distribution from off a STS/PDU. 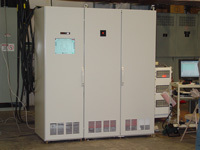 In 2008, LayerZero completed the 1200 A SafePanel short-circuit & withstand testing to ETL listing. In addition, the 1200 A SafePanel ETL Listing to UL 67 was also finalized. 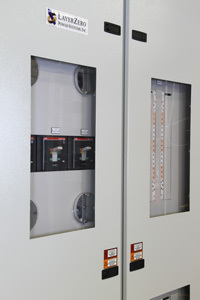 The 1200 A SafePanel was designed to fit into all LayerZero ePODs Power Distribution Unit products. 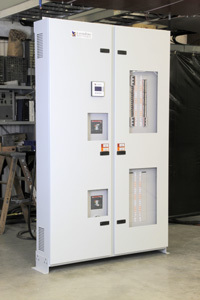 The 1200 A SafePanel was designed to fit into all LayerZero ePODs Power Distribution Unit products. During the same year, the Series 70 eRPP panel board withstand testing was completed. In addition, the company obtained ETL listing to UL 60950 for the Series 70 eRPP. Series 70 eRPP shipments commenced. In 2009 the company focused on expanding and improving technologies used to better connect LayerZero products with users, as well as refining convenience features such as Waveform Capture. The reputation of LayerZero was growing within the data center industry. LayerZero Power Systems launched eBOSS, Web-Enabled Back Office System Software. eBOSS is an indigenous web portal that was designed as a means for customers and LayerZero to effectively communicate. eBOSS was launched with product documentation, order tracking, customer service tracking, software information, and critical board tracking capabilities. In addition, the company released a wide-range of enhanced software updates, including real-time waveform capture, SNMP Connectivity, and Bluetooth Connectivity for the Series 70: eRPP. eBOSS is an indigenous web portal that was designed as a means for customers and LayerZero to effectively communicate. 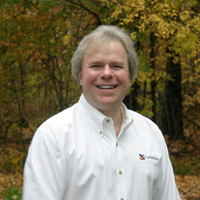 The same year, LayerZero co-founder James Galm was awarded U.S. Patent #7,589,438 for the company's Dynamic Phase Compensation Transfer Technology. 2010 marked a year where LayerZero Power Systems focused on product improvements, perfecting technologies, and further expanding the product line on Remote Power Panels. eBOSS capabilities were improved with the launch of the Configurator, a web-resource that allows customers to dynamically configure LayerZero products. In addition, the Configurator generates CSI-formatted specifications, helping to streamline the specification process. In late 2010 the company announced the release of the Series 70: ePanel, a wall-mounted Remote Power Panel. Putting power distribution on the walls provides customers with the ability to make the most of available data center space. The ePanel-1 was released with one 42-circuit panel board, and the ePanel-2 was released with two 42-circuit panel boards. LayerZero celebrated ten years of operation in 2011. In addition, two new products were added to the lineup, the Series 70 ePODs: Type-X and the Series 70: ePanel-HD. The Series 70 ePODs Type-X is a web-enabled Power Distribution Unit with a transformer and SafePanel distribution. The Type-X utilizes a touch-screen interface and has real-time power quality monitoring capabilities. The ePODs Type-X was the first Bluetooth-enabled PDU ever released to market. The ePODs Type-X was the first Bluetooth-enabled PDU ever released to market. The Series 70: ePanel-HD is a High-Density Wall-Mounted Remote Power Panel, designed to allow data center facilities to put distribution on the wall, and be ready for ultra high density distribution. The space-saving wall-mounted design and ultra high density capabilities have proven to be useful in high-density data centers. 2012 was a year of exceptional growth for LayerZero Power Systems, both in product development and expansion within the company. The company announced the release of the 4000 A Series 70: eSTS Static Transfer Switch. LayerZero's 4000 A eSTS is designed to protect the power for large data center processing operations, and even entire buildings.The largest Static Transfer Switch offered by LayerZero, the 4000 A eSTS utilized a completely updated design. In recognition of the progress made by LayerZero, the company was awarded a Weatherhead100 award for being one of the fastest growing companies in Northeast Ohio. LayerZero's 4000 A eSTS is designed to protect the power for large data center processing operations, and even entire buildings. In an effort to fulfill increasing demand for LayerZero Power Systems products, the company established a state-of-the-art world headquarters located in Aurora, Ohio, USA. In 2013 LayerZero Power Systems concentrated efforts on perfecting every detail of the product designs. Determined to produce the highest quality power distribution products on the planet, the company updated designs for all product lines to make the most of enhanced manufacturing ability. From increasing the mechanical ruggedness of the cabinets to making quantum improvements in operator safety, the LayerZero products produced in the Ohio-based facility are the finest in the world. LayerZero Power Systems' manufacturing facility is highly automated, utilizing advanced technologies that facilitate large scale production. Significant software updates in LayerZero Power Systems products include the release of the LZ-Modbus client application, and updates to the Graphical User Interface across all product lines. LayerZero Power Systems' manufacturing facility is highly automated, utilizing advanced technologies that facilitate large scale production. The ePanel-1 design was also updated, allowing for a higher level of operator safety than previous designs. The company focused efforts in 2014 to allow for increased levels of configurability, while maximizing product quality and decreasing turnaround time. In addition, LayerZero has redesigned and expanded key product features in an effort to further increase product safety. LayerZero Power Systems was awarded U.S. Patent #8,674,555, “Neutral Switching High Speed AC Transfer Switch" in 2014, leading the way towards improved power reliability technologies. Utilizing highly-advanced manufacturing technology, LayerZero Power Systems delivers uncompromising product quality and attention-to-detail. Since the first LayerZero installation in 2001, LayerZero has grown to an installation base of thousands of units installed worldwide. LayerZero has been an innovator in critical power distribution, delivering the only TMR Enabled Static Transfer Switch in the mission-critical industry, and providing fully Selective Trip Coordinated power distribution systems. To become as successful as LayerZero has, the company has relied heavily on its team of outstanding engineers and professionals over the years. LayerZero is proud to celebrate this tremendous achievement. LayerZero continues to lead the industry with premium products which are safe, reliable, information centric and highly connected. We offer a customer experience that is second to none: We listen, we internalize and we act to serve your needs. In 2015, LayerZero Power Systems refined manufacturing processes, incorporating automated material handling improvements to facilitate increased throughput. In addition, the company made product updates across the Power Panels product line, providing higher levels of configurability. LayerZero began to ship all SafePanel products with our patented SafePanel Shrouds as a standard feature. Focusing on continual innovation with regards to operator safety, LayerZero products have no exposed live parts. All products designed by LayerZero have no exposed live parts. LayerZero Power Systems released Zen DPQM and Zen SSQM, the next generation of power quality monitoring systems. Zen DPQM and Zen SSQM are hardware and software systems that provides critical facilities workers with the capabilities to view all apsects of power distribution in real-time. LayerZero Power Systems has made improvements to the power quality monitoring system in an effort to provide state-of-the-art monitoring capabilities for the long-term. Complete with local and remote connectivity options, Zen by LayerZero Power Systems is a highly capable vendor-neutral monitoring system. In addition, the company increased development on the four-pole static transfer switch line. In 2017, LayerZero Power Systems continues to innovate in the areas of safety, reliability, connectivity, and monitoring.